OneTranslator offers prepaid, on-demand, consecutive interpretation services 24 hours a day from any phone in the U.S.
OneTranslator's state-of-the-art call centers provide maximum efficiency for trouble free connection to our trained staff of professional interpreters. OneTranslator's services can save you time and clarify critical information during medical, business, or personal situations. OneTranslator is one of the latest innovations of Universal Calling Inc.
Universal Calling Inc., a pioneer in prepaid telecommunication, has delivered unparalleled quality, reliability, and service for more than seven years. 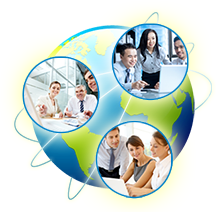 Through its worldwide communication facilities in Houston, Irvine, Atlanta, and Chicago offices, the company provides exceptional long distance service at industry-low rates. Universal Calling's divisions, including CallingCards.com, ConferenceCalls.com, and more than 600 other telecommunication domains, deliver over 1 billion minutes each month. FOCUS - By concentrating on the Business Top 170, OneTranslator assures the customer of instant access to the most highly trained language translators by industry specialization. View confidentiality statement. POWER - OneTranslator utilizes state-of-the-art, proven telecommunications and call center technology to lower costs and speed response time. PIN-less access, online account monitoring, local access numbers and the lowest long-distance rates all combine to maximize efficiency. PERFORMANCE - All of OneTranslator's Unique Competitive Advantages are for one reason - to give you Peace of Mind. Above all, we pride ourselves on efficient and courteous customer service.